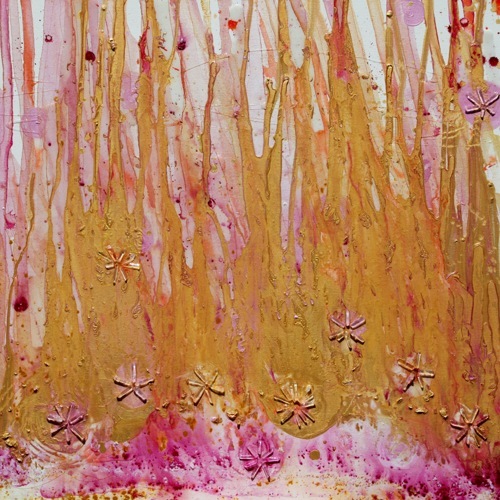 Acrylic, resin and crystals on canvas. 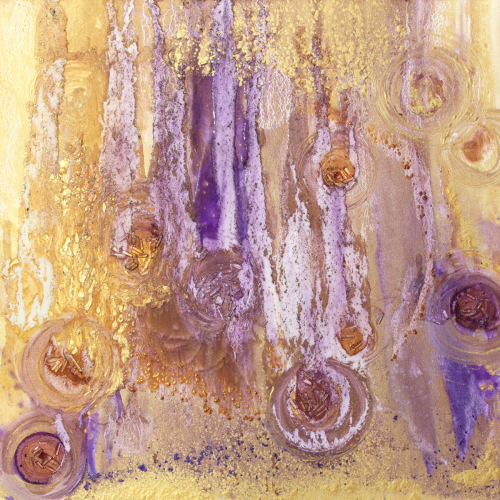 The crystals embedded in this painting are Tiger's Eye, Quartz and Amethyst. 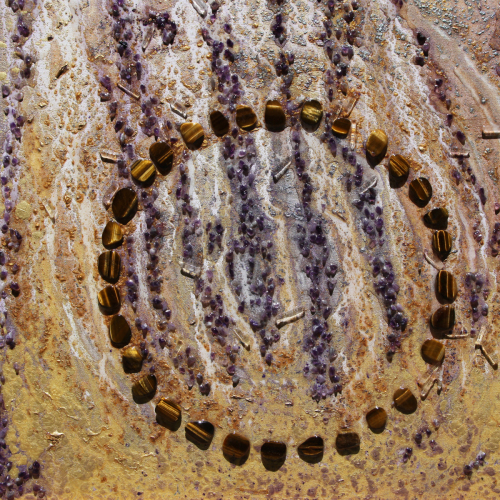 The ring of Tiger's Eye adds the upper charka energy of Third Eye, inner-sight. These crystals add these higher vibrations to assist in emenating beneficial energies to you or you space to create a healing room of clear vision and activated intuition. 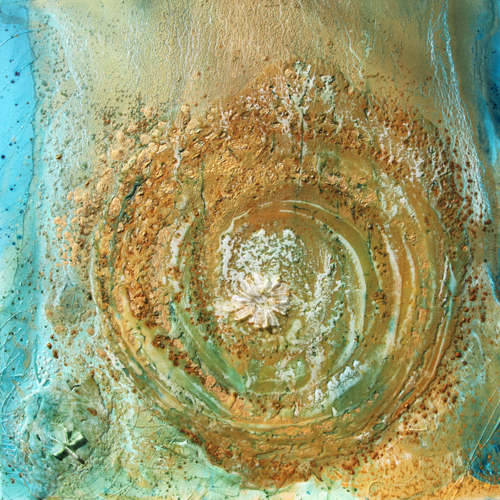 Cosmometry studies the fundamental patterns that create life. 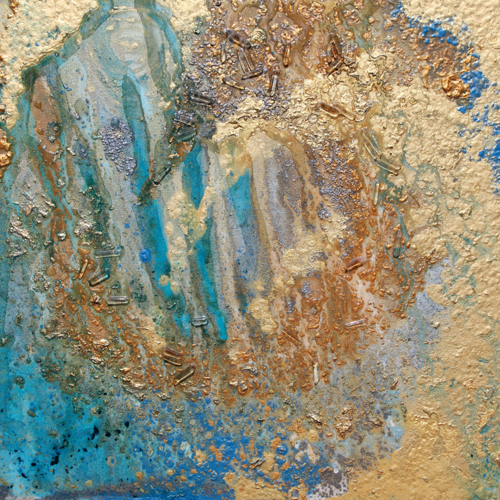 It is felt through visionary artwork created in a consciously connected state of meditation. 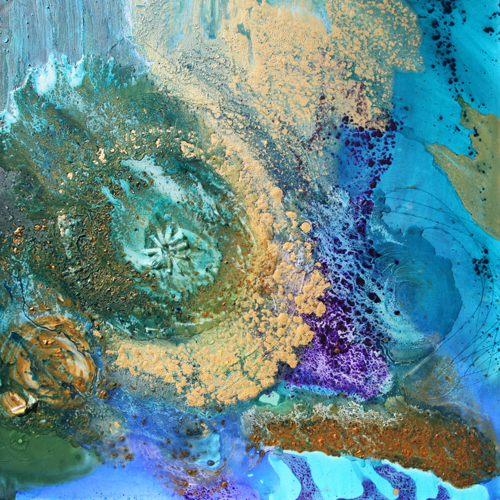 The hand stretched canvas with fractal dimensions as the platform serves to further crystalize its concepts. 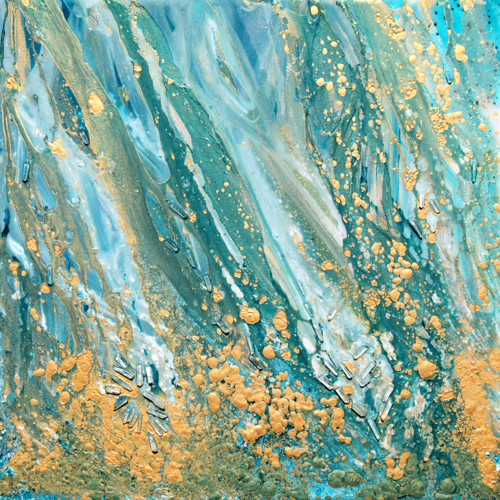 This energetic patterning talks about our existence and that of the cosmos in an elegant and harmonious wholeness. 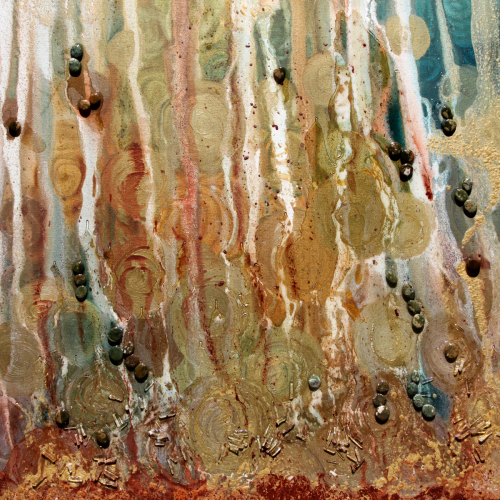 Sea Jasper spheres used in this artwork ground the cosmic and poured water elements. 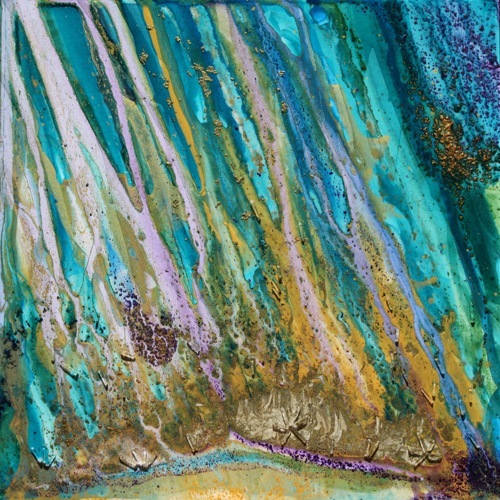 They add a vibration of the gemstones themselves to work with consciousness. 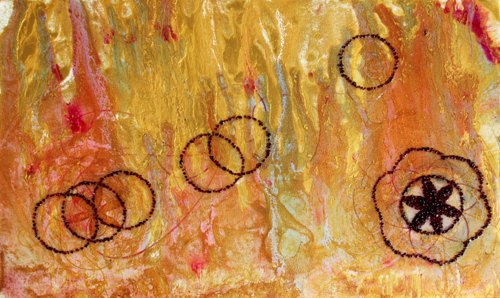 Tiny spheres within spheres work like endlessly charged fractal batteries to generate creativity. Our universe is structured with geometry in a flow of etheric water. 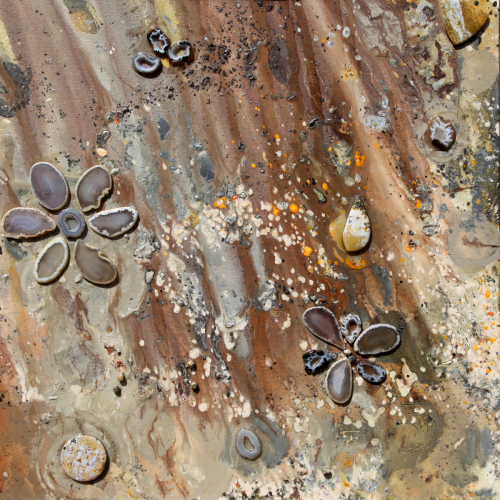 Embedded on this painting are sea jasper gemstones for a flow within a flow fractal effect. 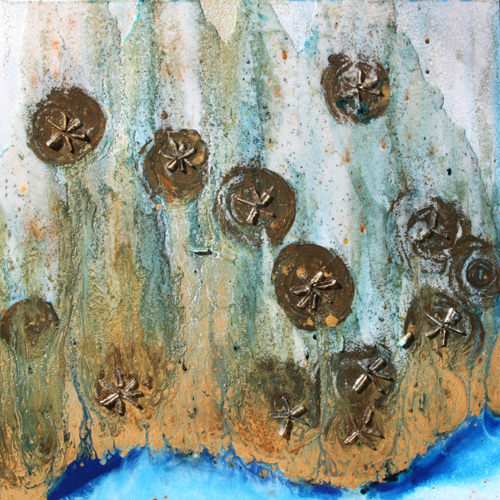 A geode flower pattern radiates beneficial energy into the room. 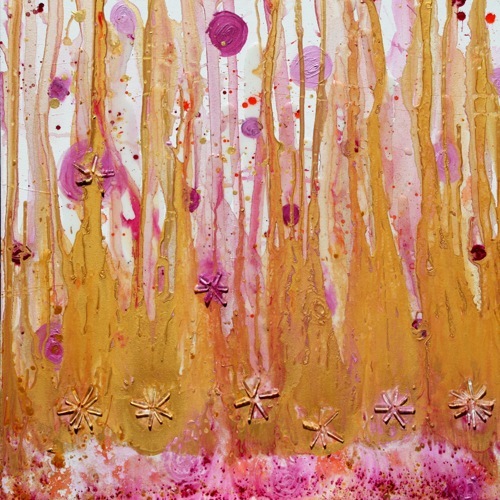 Like an overhead view of either cosmos or something microscopic, these patterns transport you inter-dimensionally. 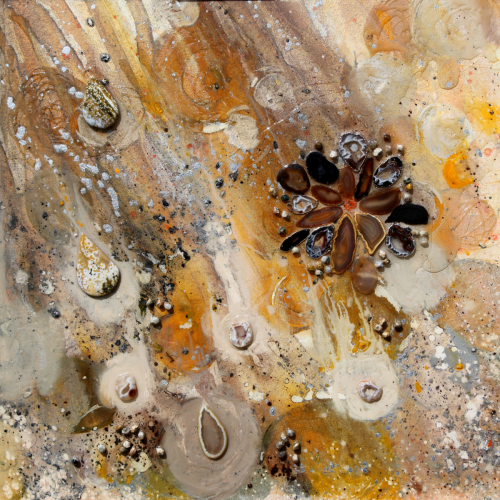 Embedded on this painting are sea jasper spheres for a flow with a flow fractal effect. 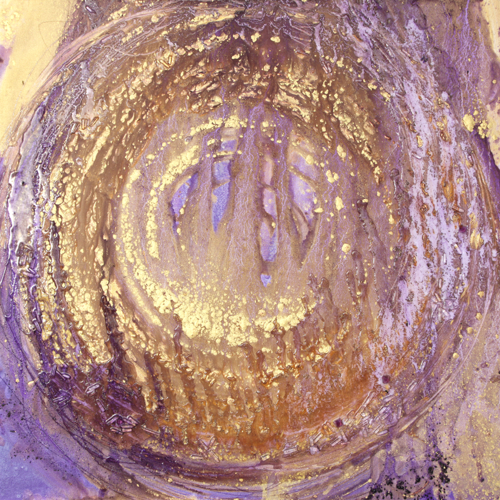 Geode flower patterns add sacred geometry. 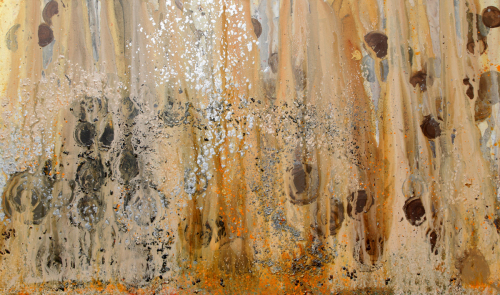 Acrylic, Ink, quartz and resin on canvas. 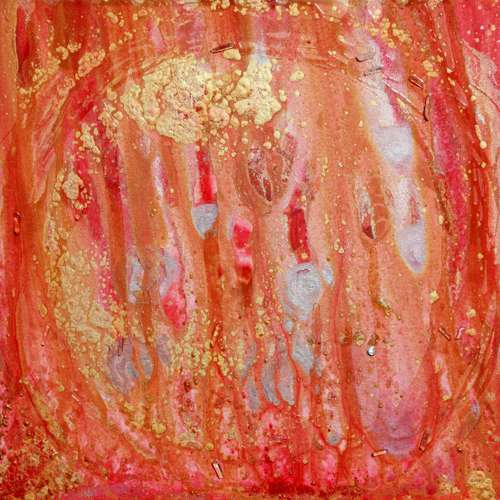 Exhibited by Ashok Jain Gallery, NYC at Art New York 2017. 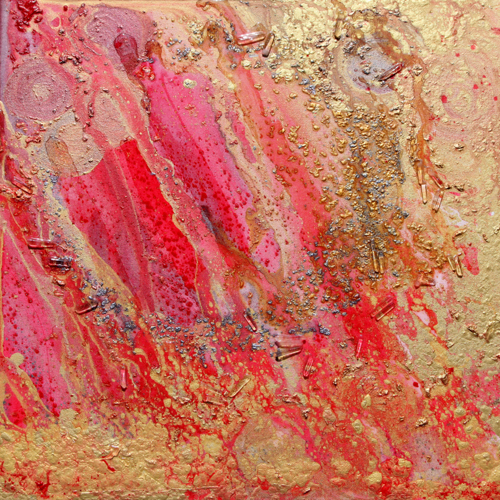 This poured painting includes quartz crystal points in resin as well as a crimson paint toned with gold. Luminous and precious. 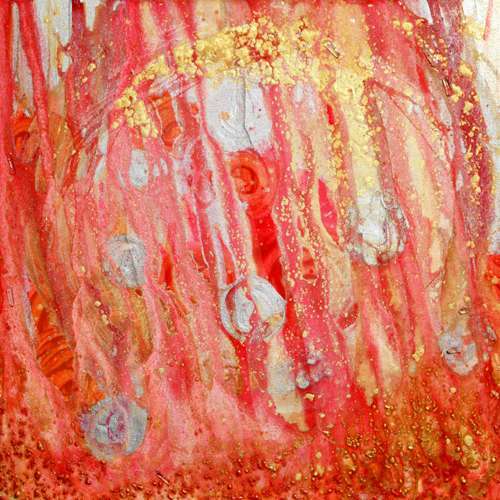 This painting is made outside in the sunlight to capture the creational energy of the sun within the crystals and resin and gold paint as it dries for biogenesis bliss. 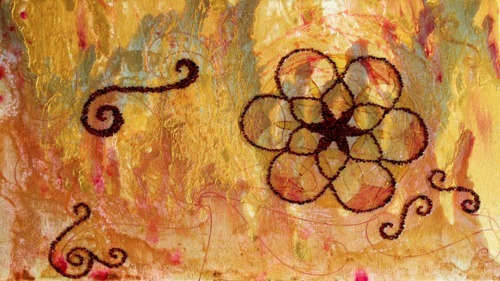 Using semi-precious garnet gemstones, I created this painting with the flower of life pattern outline. 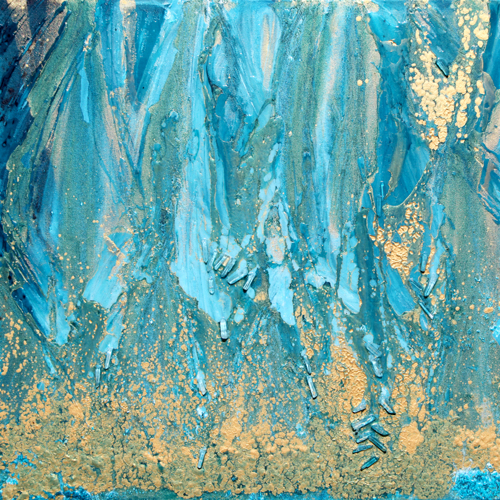 The poured paint is with gold and aqua blue resin. 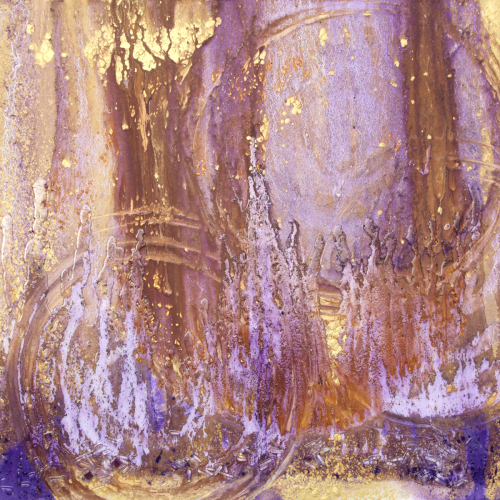 This painting was created outside in the Autumn sunlight and reflects my research into empowerment, healing, consciousness and ancient wisdom. 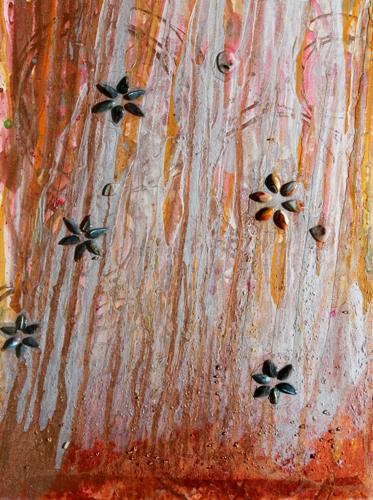 Flower of Life pattern as the under-painting, then lending itself to the grid of crystal embedded in resin. This pattern has been foremost in my art this year, as it is the image on my sound healing instrument, the 36" Flower of Life Gong. 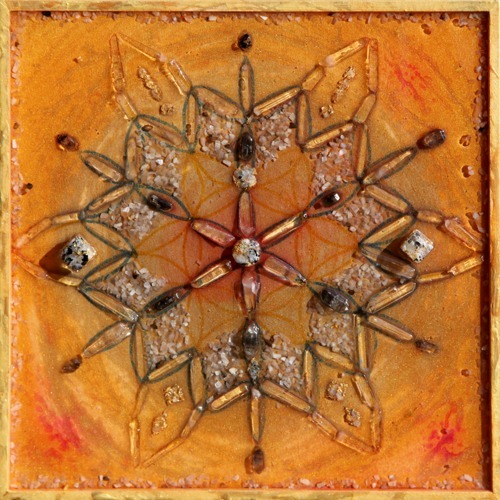 As a crystal grid, it serves to generate positive energy and includes the beautiful "organite" like jewelry of Kelsey Pardonner including opals and gold leaf. Her gift to me of these gem pieces, inspired the crystal grid in turn in a true collaborative effort.